Ready to make this year the kindest year ever? 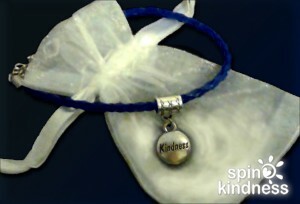 Let’s join together to start chains of kindness, to create ripples of kind acts, and to radiate kindness wherever we go! 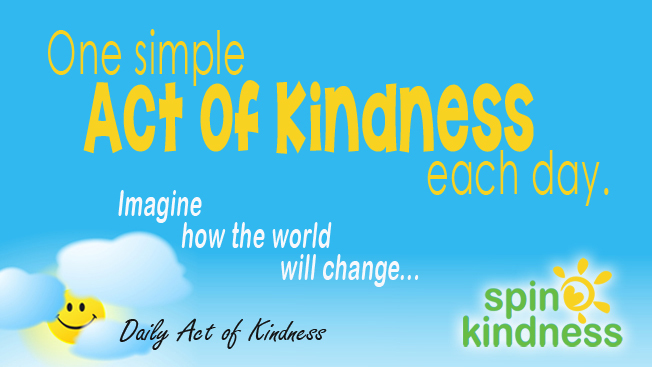 Spin Kindness will post a daily act of kindness on our Facebook page and Twitter designed to help you start the day with intentional kindness. Most of the acts are completely free and easy to incorporate into your normal routine. If one doesn’t fit within your day, you can select another from our list of suggestions. Click “like” on our Facebook status or favorite our tweet for the day to show you are accepting the challenge. If you can, come back and tell us on the blog, Facebook, or Twitter about what you did. Want to do them on your own, get ahead, or get ideas? See the list of all 100 Daily Acts of Kindness. We’d like to show YOU some kindness in appreciation for your help in spreading kindness! If you are participating in our challenge, please comment on the individual Acts of Kindness posts. When you have completed any three acts and left comments about your experiences on three of the 100 Acts of Kindness pages, we’ll send you a free Kindness Reminder Bracelet. After commenting on three pages, click the JOIN US NOW button to complete the form telling us where to find your comments and where to send your bracelet. You can keep it or share it!